My name is Michele and I am Jays Animal Feeds. and the 1st Sat of every month. At present I do not deliver or accept Credit or Debit cards. Check my facebook page for Saturday opening times. All products are offered subject to availability and provided on a first come basis. Due to popular demand Jays will also be open on the 1st Saturday of the month. I produce meat for the B.A.R.F. Diet, for owners who wish to feed their dogs the natural way. The meat has no additives or preservatives added to it. The meat is collected, processed, packed and frozen all on the same day, this ensures the quality, and is as fresh as possible. 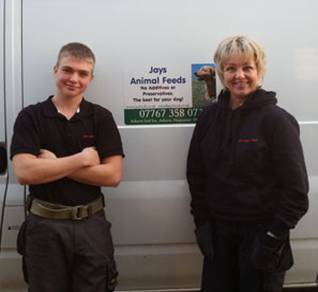 Jays Animal Feeds is registered under DEFRA, who undertake statutory checks on Jays Animal Feeds. On a monthly basis Jays has a sample of each of our meats independently tested, at Northern Hygiene Laboratories Ltd, for Salmonella and also for Enterobacteriacea. Jays Animal Feeds also has had analysis reports done for each of our meats, this shows the protein, fat and nitrogen content, this has proved helpful to our customers. All Products remain the property of Jays Animal Feeds until paid in full with cleared funds.